Albatross Island is one of just 3 breeding sites for shy albatross on the planet, all of which are in Tasmania. The colony here is home to just over 5000 breeding albatross pairs, approx. 40% of the total breeding population. The island is located just over 30km from mainland Tasmania in the Hunter Island group in western Bass Strait. It’s an 18 ha nature reserve, measuring approx. 1500m long and 300m wide, and access is by permit only. The island has a rocky jagged coastline and high cliffs, but the interior is undulating, with a number of gulches and caves. Aside from the albatross, there’s plenty of other wildlife around, including burrowing petrels, sea eagles and fur seals. 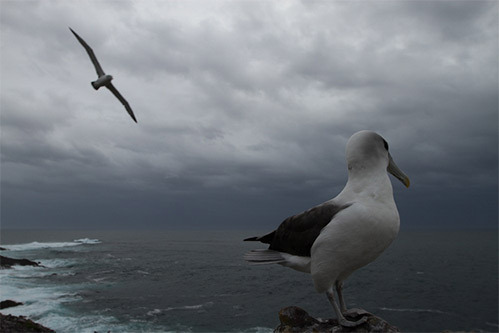 Long-term monitoring of shy albatross has been conducted by the Tasmanian DPIPWE on Albatross Island since 1980. Current monitoring shows the population is in decline, likely a result of fisheries interactions and changes in resource abundance and distribution as a result of a changing climate. When on the island, the team camps in a large cave that provides shelter from the elements, but is also home to penguins and fairy prions so the nights can be quite loud! All food, water and supplies are brought to the island and everything taken off again at the conclusion of the trip. Although this trip will likely be about 4-5 days, the team will carry enough supplies for about 10 days in case the weather turns. The primary annual monitoring trips are in October (breeding effort and band reading) and April (breeding success and chick banding). This 5-day trip is scheduled for some time between 5-15 December 2016, depending on a suitable window of good weather. At this time, the albatross eggs laid in September will have hatched and small chicks will be sitting on nests, with some still being attended by brooding adults. Census of hatching success in study plots. Management actions to increase the adaptive capacity of shy albatross in the face of a changing climate. Retrieve several GPS loggers deployed on birds in October. Collect faecal samples for ongoing investigation of diet at different stages in the breeding season. Census of breeding fairy prions. Check function of GigaPan high resolution remote camera. This is a unique opportunity to follow the activities of a scientific field trip in real life and real time. There are lessons available from the old Search for the Shy Albatross program that you can adapt to this project. Alternatively, and being close to the end of the year this is more likely, you can simply tune into the daily reports from early December and follow the adventure as it unfolds. If it sparks a few discussions and investigations, awesome. If it shows students a different side of scientific endeavour, great. If it simply inspires you to make up your own summer adventure, that'll do just fine. The discussion board will be active during December so if you have questions for the team on the island just log in and get in touch.